Richard Parsons is a veteran bank executive and now an independent industry researcher and consultant. A national banking analyst, with ties to northeast Ohio, says the merger of regional powerhouses Huntington Bank and FirstMerit is catching industry-wide attention. WKSU’s Tim Rudell talks with him. Rick Parsons grew up in Avon Lake before 30-plus years in banking took him to an executive vice presidency of Bank of America. He now writes about the business, is an independent management advisor and conducts seminars including with the Ohio Bankers League -- the century-old association of financial institutions in the state. And, he uses his Ohio’s roots in another way too -- as a research base for projecting banking trends. 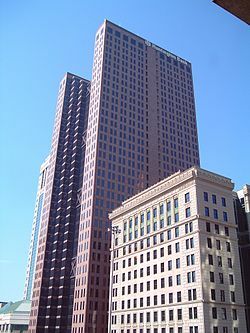 “'As Ohio goes’ in presidential elections is true for banking,too.” The state is a microcosm of the nation with the same mix of mega-banks, midsize, regional banks, and local banks. The economics of banking, with steadily increasing cost and flat income growth, is making bank stocks less attractive to investors. Huntington’s and FirsMerit’s stocks are valued lower now than at the turn of the millennium. Merging is a way for banks to consolidate personnel -- where more than half of their controllable costs lie -- and cut costs by cutting jobs. A merger also reduces the number of competitors in the marketplace. That can affect customers, although it usually does not since there is still generally a lot of competition.